Many were surprised with the controversial results of the last US Presidential election. The former First Lady Hillary Clinton didn't achieve her goal of becoming the first woman president of the United States of America. Even though she didn't win, Hillary and her husband Bill are still popular costume characters due to the past political scandals. Aside from wearing colorful pantsuits, Hillary is also known for wearing many different hats through her life being the former First Lady, Senator of New York, and former Secretary of State. Now it's your opportunity to wear her Halloween mask! 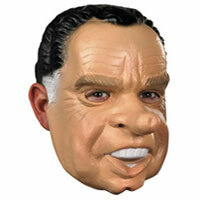 Listed below are funny Hillary Clinton Halloween masks on sale online. Pair this up with a Bill Clinton mask and you can go out as a satirical political couple to your next dress up costume party. 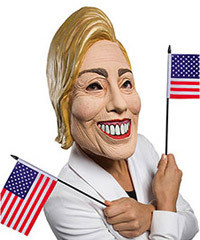 If you want to be the first potential female President of the USA, we recommend this quality Halloween mask. This vinyl masks showcases he former First Lady's signature facial features and hairstyle. Available in one size fitting most adults and teens. This a vacuform face mask of Hillary Clinton. This plastic half mask has attached elastic bands that make it easy to wear over your face. Simple and affordable. If you wanna be scary and political at the same time, try out this zombie Halloween mask version of Hillary Clinton. This monster mask has green hair, dead white pale color skin, scary sore bug eyes and a bad teeth! Clinton's political rival Donald Trump promises to send "Crooked Hillary" Clinton to prison if he gets elected as president. If you agree, you can add any silly Hillary mask (sold separately) to this orange prisoner uniform and create your own humorous Crooked Hillary prison costume for Halloween! Disguise yourself as former 42nd US President Bill Clinton and potentially the first male First Lady in this vinyl Halloween mask for adults. If you don't want to wear a mask for Halloween, we suggest you trying on Hillary's wig with her trademark hairstyle. Just add a pantsuit, a little make-up, and her campaign buttons to complete your ultimate Hillary makeover. Remember to get a wig cap to help keep your wig on. Hillary's Republican rival, Donald Trump, now has own Halloween mask. This caricature mask captures all of Donald Trump's distinctive facial features so people everywhere will instantly recognize you as America's most controversial billionaire! Dress your partner up as the controversial millionaire if you want to go as the most unlikely couple on Halloween night! Vinyl Halloween Mask of former President Bill Clinton Vinyl.